Scholar of the third (?) century; mentioned once only (Mek., Beshallaḥ, Wayeḥi, 3), a haggadah of his being transmitted by R. Nathan. 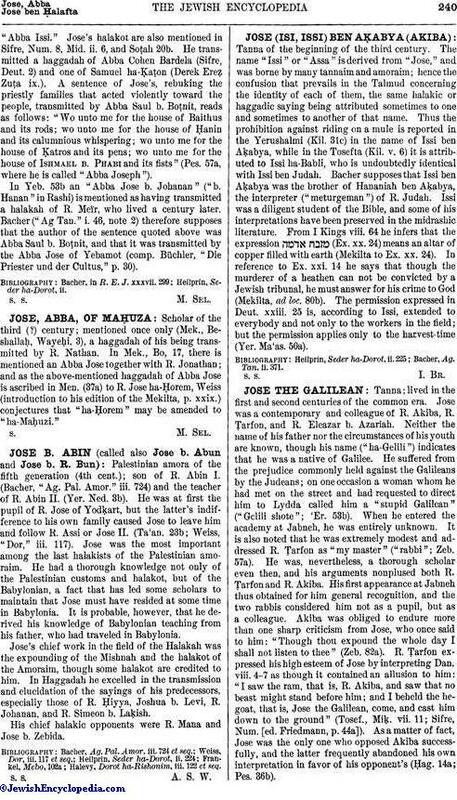 In Mek., Bo, 17, there is mentioned an Abba Jose together with R. Jonathan; and as the above-mentioned haggadah of Abba Jose is ascribed in Men. (37a) to R. Jose ha-Ḥorem, Weiss (introduction to his edition of the Mekilta, p. xxix.) conjectures that "ha-Ḥorem" may be amended to "ha-Maḥuzi."